An organisation dedicated to raising the profile of mathematics and its applications. 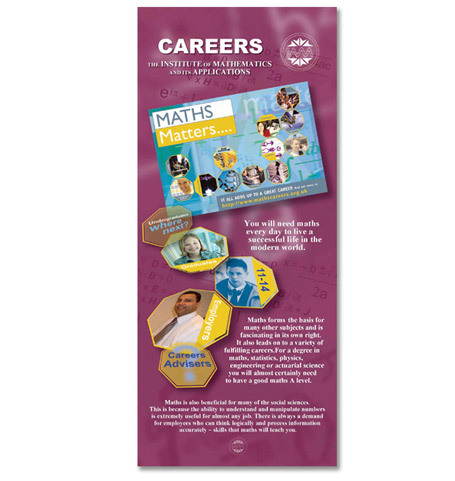 We were commissioned to create strong and lively banner displays to communicate the possible career opportunities within maths. Using the existing brand colours we created a strong abstract background including references to maths over which we added specific imagery of people in various maths based careers. We created movement and dynamism as well as a clear message where we advised them not to include too much copy, which is a common mistake on banner stands. All these improvements made a positive, modern & dynamic change from their previous material. A change that has achieved great results, they are now 'seen' at employment events and are generating more interest.